Cummins Chiropractic has the good fortune to be neighbors with Bellevue College, and we loved recently having an opportunity to be involved with them. BC Reads is a program where everyone on campus reads the same book and invites people to come to campus and give presentations related to the reading. The current book selection is called “The Boys in the Boat” by Daniel James Brown, and the topic is close to our hearts here at Cummins Chiropractic. 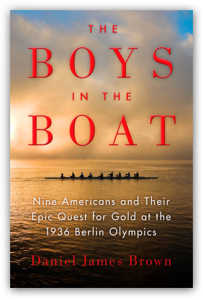 It’s a well-written story about the rowing team that rowed in the 1936 Olympics and were from the University of Washington. As many of our friends know, I won the national rowing championship with the University of Washington and with the US National Rowing Team in 1997. My wife Anna is an extremely accomplished rower, having won the Olympic gold and silver medals and being a four-time FISA World Rowing Champion. Bellevue College invited Anna to join them and give a presentation to a few of their classes. She spoke about her experience as a member of one of the girls in the boat in 2000 and how it related to that of the boys in the boat from 1936. Anna enjoyed being able to share her memories, and the classes that heard her speak had the chance to relate the experience of her team to that of the 1936 rowing team, nearly 80 years ago. It’s always fun for Anna and me to share our years of rowing, especially when seeing how it relates to our community’s history. We understand what it’s like to have goals and to strive to reach them, whether your goals are health-related or about your family or education. We enjoyed this wonderful opportunity to share with Bellevue College and hope we’re able to do more of it in the future! To find out more about “The Boys in the Boat,” visit the author’s website. To find out more about BC Reads, click here.